Hand drawing is an integral part of the design process and central to the architecture profession. An architect's precise interpretation and freedom of expression are captured through hand drawing, and it is perhaps the most fundamental skill that the designer must develop in order to communicate thoughts and ideas effectively. In his distinctive style, world-renowned author Francis D. K. Ching presents Design Drawing, Third Edition, the classic guide to hand drawing that clearly demonstrates how to use drawing as a practical tool for formulating and working through design problems. While digital tools continue to evolve, this Third Edition includes new illustrations and information on the latest digital-drawing techniques. 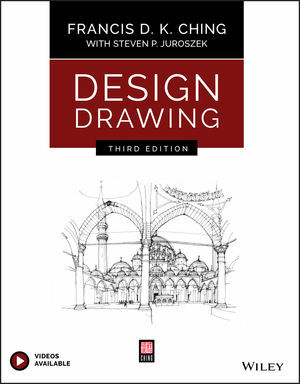 Written and illustrated for professional architects, designers, fine artists, illustrators, instructors and students, Design Drawing, Third Edition is an all-in-one package and effective tool that clearly demonstrates drawing concepts and techniques in a visually stimulating format that outshines other works in the field. FRANCIS D. K. CHING is Professor Emeritus of Architecture at the University of Washington and is a leading global authority on architectural drawings. He is the author or coauthor of numerous architecture and design books, including Architectural Graphics; Architecture: Form, Space, and Order; A Global History of Architecture; Building Construction Illustrated; Building Codes Illustrated; and Interior Design Illustrated, all from Wiley.